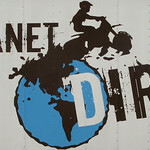 On Sunday, Kenny and I joined friends from ADVrider.com to partake in an introduction to dirt bike riding class conducted by Planet Dirt. 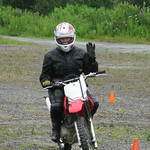 The company provided us with a suite of assorted Honda dirt bikes ranging from 50 to 230 CCs to use during the session. They also made available dirt helmets and goggles for any persons who did not have their own. Their instruction program is set to educate a range of skill sets, from the child who has never sat on a motorcycle to the long time street rider that is looking to broaden their horizons. Our session was a private 8 person class of street riders who all knew each other so there was an immediate comfort level that put everyone at ease. Our instructor was very thorough, laid back, patient and proved a wealth of information on any motorcycle related question thrown his way. He had something like 40+ years of on and off-road riding under his belt so he’d been there done that, tired of it and rediscovered it again. He was able to accurately identify the hang-ups or feelings that I was personally experiencing and help me to move away from my years of automatic road riding behaviors and replace them with the correct body movements and positioning for the dirt. Though any one of us as street riders would probably be able to make our way down an unpaved fire road just fine, none of us had any significant time in the dirt. No matter how many years you have in the saddle, there is always something new to learn. In my case, I found that there were many things that I had to unlearn as it applied to positioning my body on the motorcycle. All of the riding done was low-speed, focusing strictly on technique and developing the building blocks of proper body positioning that a rider uses throughout the rest of their real world off-road riding. We went through drills like riding over obstacles, effective low-speed maneuvering in tight spaces, proper body positioning while traversing hills horizontally, quick and easy techniques for turning a stalled bike around on a hill in a small footprint. It was all good stuff. It was exciting to learn something new and challenging. I finished up the class wishing that there was a second day of trail riding to further fortify the new skills. That looks like barrels of fun! Even better that everyone in the group knew each other! It really was. We had a really great time doing the class with everyone. It was a nice way to get an understanding of the body mechanics of riding well in the dirt. I predict that you guys will have a pair of 650gs’ and will forget what pavement is. Truth be told, as cool as dragging knee is, I really miss making my riding buddies eat my roost! :oD I don’t know. I don’t need another hobby!!!!!!!!!! Didn’t know that you came from a dirt background – pretty cool. Have you given it up completely? I wouldn’t go so far as to say I come from a dirt background but there have been many a summer day messing around on them.